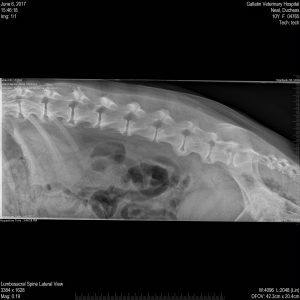 Abstract: “Duchess”, an 8 year old female spayed German Shepherd, presented for acupuncture therapy after having a hemilaminectomy to correct a compressed spinal cord at the L7-S1 region. Four weeks after surgery, Duchess’ owners were concerned with her pain level and the fact that Duchess still had an impaired gait which appeared to be worse than before surgery. Duchess displayed neurologic deficits such as crossing her hind limbs, toe dragging, decreased proprioception and hind limb paresis. Prior to acupuncture therapy, Duchess had moderate lumbar hyperesthesia, thoracolumbar kyphosis, forelimb trigger points, and severe bilateral hind limb toe dragging during ambulation. Duchess’ acupuncture treatments focused primarily on her lumbar pain with a goal to increase neuromodulation in the lumbar and sacral spinal cord segments. Electroacupuncture was incorporated in her therapy to help facilitate this. Secondary treatment objectives included addressing historical hip dysplasia and forelimb compensatory trigger points. After once weekly treatments for four weeks, the owners noted that Duchess had improved energy during walks and improved ambulation at home. Physical exams after her treatment revealed decreased spinal pain, and decreased pelvic limb neurologic signs. Duchess continues to receive maintenance acupuncture therapy every 3 weeks. 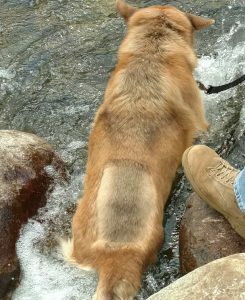 History and Presentation: Duchess, an 8 year old female spayed German Shepherd presented for acupuncture therapy on 11/1/2017 after having a hemilaminectomy on 6/7/2017 to correct a compressed spinal cord segment at L7-S1. Her operation was performed at a referral surgical hospital. Duchess had a previous diagnosis of grade 4 hip dysplasia as a young dog and had been medically managed for 5 years with Adequan injections and occasional carprofen use. Duchess’ owners noticed a change in gait and neurological deficits in the spring in 2017. They took her to their primary veterinarian for a diagnostic work up of symptoms on 6/1/17. Her physical exam at the time stated that her hind toes were dragging during ambulation and had quadriceps atrophy especially on the right hind limb. She had conscious proprioceptive deficits in both hind limbs. Her reflexes at that time were consistent with pelvic limb lower motor neuron disease. All other physical exam parameters and bloodwork were normal at that time. Diagnostic imaging was pursued by the referring veterinarian to determine if her previously diagnosed hip dysplasia was progressing or if there was a different etiology for her progressing clinical signs? 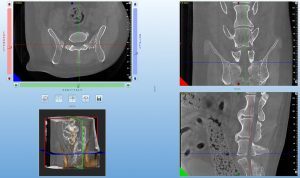 Radiographs revealed a narrowed disk space at L7-S1. (Please refer to images titled; “Duchess Radiographs Lumbar Spine Lateral 1 and 2“). Duchess had a CT scan which confirmed disk compression at L7-S1, more significant on the right side than left. Please refer to attached images titled (“Neal Duchess MPR Shot”). Surgery was elected at that time to relieve the compression. Duchess had no post-surgical complications and was sent home with physical therapy recommendations of water treadmill, physical therapy and acupuncture therapy. Her owners did not have access to a water treadmill facility but they took her swimming in the local river and appreciated mild improvement in Duchess’ gait for about 24 hours after swim sessions. (Please see photo titled, “Duchess Swimming“). Duchess’ owners discovered that the Veterinary Clinic offered acupuncture therapy starting in the fall of 2017 and booked an initial evaluation. Duchess’ drug regime at the time of presentation for acupuncture included tramadol 150 mg twice daily, 75 mg of carprofen twice daily and gabapentin 300 mg 3 times daily. Physical Examination and Clinical Assessment: During the physical exam for the first acupuncture session, Duchess was bright, alert and responsive (BAR), with normal vital signs and healthy body condition score (BCS). Her neurological exam revealed a normal cranial nerve exam with decreased conscious proprioception (CP) on both hind limbs with the right side being more prolonged than the left. She had decreased patellar reflexes and moderated quadriceps atrophy which was consistent with lower motor neuron disease from her previous disk compression site. Her myofascial palpation exam showed moderate hyperesthesia over her lumbar spine at the level of L5 extending to her sacrum. She exhibited a pain response over both coxofemoral joints which was expected due to her history of hip dysplasia. She had trigger points and taut muscle bands in the long and lateral head of the triceps bilaterally. Gait analysis revealed that Duchess knuckled over with both hind limbs, with the right hind limb worse than the left resulting in heavily worn toe nails. She had apparent lumbar kyphosis and was very slow to rise during stand-sit exercises. (Please see photo titled “Duchess Walking” to appreciate the level of kyphosis 1 month after surgery). Acupuncture Treatment Points: Appointment 1: Bladder (BL) 23, 25, 27, 40, 54, 60. Gallbladder (GB) 29-30. Governor Vessel (GV) 14, Baihui, BaFeng points (1st appointment only). Small Intestine (SI) 9, Trigger points within the long and lateral head of the triceps. Appointment 2: BL 23,25,27,40, 54, 60. GB 23, 30. GV 12 GV 20. Baihui. Triceps trigger points. Appointment 3: BL 23, 25, 27, 40, 54, 60 GB 29, 30. GV 14. Baihui. Maintenance therapy sessions continue to be similar to the initial treatments and are modified based on each appointment’s physical and myofascial exam. Needles used for Duchess’ therapy included Seirin J type 0.14x15mm for Bafeng points during her first acupuncture session, Seirin J type 0.20x30mm for non-electrostimulation sites and Hwato 0.20x25mm for electrostimulation sites. Differential Diagnosis: Based upon physical exam, neurological exam, myofascial exam findings and review of the diagnostic images of Duchess, the practitioner was able to agree with the previous problem list and diagnoses from the referring veterinarian. The previous medical work ups were very thorough and complete. The diagnosis of spinal cord compression leading to lower motor neuron disease was consistent with all previous medical records and current physical exams. No other differentials were considered as possible diagnoses at this time. Due to Duchess’ level of sensitivity and reactivity during the examination, it was decided to focus on the lumbosacral pain as her primary problem. The hip pain would be addressed secondarily and the taut muscle bands in the triceps would be addressed in a tertiary capacity if she was very accepting of needle placement. Medical Decision Making: The primary therapeutic rationale for Duchess’ treatment was to neuromodulate the spinal cord segments in the distal lumbar and sacral region, specifically L7-S1. Before beginning on acupuncture points for her primary treatment areas, GV 14 and Baihui were used to assess her willingness to accept needle placement. Baihui also was chosen due to its effect on lumbosacral pain, pelvic neurological dysfunction and neuromodulatory effects on the mid-caudal lumbar spinal nerves. Bladder points 23, 25 and 27 were chosen due to the fact that they would address the spinal hyperesthesia via neuromodulation of thoracolumbar, lumbar and sacral spinal nerves. Electrostimulation with an ITO unit was applied from BL 23 to BL 27 bilaterally at a low frequency of 1.5 and 4 Hz in continuous wave for 5 minutes. BL 40 was chosen due to stimulation of the tibial nerve and is indicated for pelvic limb paresis and pain. BL 60 was used to stimulate the fibular and tibial nerve. Electrostimulation with an ITO unit was applied between BL 40 and 60 bilaterally at a low frequency of 1.5 and 4 Hz in continuous wave for 5 minutes. Due to her history of toe dragging, one of the treatment rationales was to use Bafeng points to help stimulate nerve pathways from her digits to her spinal cord. Duchess did not tolerate Bafeng points very well so they were only used during the first appointment. Placement of the Bafeng needles was the only time she ever became agitated and unwilling to lay still during any of her sessions. The secondary treatment rationale was to address the historical pelvic pain in her coxofemoral joints. BL 54 was used with GB 29 & 30 for the hip triad to help address her concurrent hip dysplasia and pain. The third treatment rationale for Duchess was to address her thoracic limb compensatory pain from her weakened pelvic limbs. SI 9 was also used to help alleviate her shoulder pain and dry needling techniques were used to release trigger points in the long and lateral head of the triceps. Outcomes, Discussions, and References: During the Duchess’ treatment her owners reported that after doing acupuncture weekly for 4 weeks, Duchess had more energy during walks. She would have intermittent periods of trotting during walks which she had not been strong enough to do since before her surgery. They also appreciated improvement in Duchess’ ability to walk up steps and she no longer stumbled. Duchess was re-evaluated at the beginning of each acupuncture session and it was evident that she was improving with each session. Her level of lumbar kyphosis decreased over the four week treatment course and she had decreased toe dragging which led to increased length of her toe nail bed. She had increased strength and speed doing stand to sit exercises. (Please see video titled “Duchess 4 Week Post Tx”). Duchess had decreased trigger points in her triceps toward her 3rd and 4th acupuncture treatments and did not need as many treatments for compensatory issues in her front limbs. The amount of pain medication Duchess was prescribed was decreased after her acupuncture sessions. She discontinued tramadol use and her carprofen use was changed to an as needed basis. The dose and frequency of gabapentin was not decreased as she appeared to have more hind limb paresis when the gabapentin dose was decreased. Describe Your Medical Acupuncture Experience: Duchess’ case was a very positive experience as one of the first acupuncture patients at the Veterinary Clinic. Duchess was very accepting of her therapy and all of her sessions were calm and relaxed. Her progress was evident during subsequent visits to the clinic and to her owners at home. Their testimonials to other dog owners in the community has led to more people to schedule acupuncture consultations at the Veterinary Clinic. Working with Duchess helped increase the confidence of the practitioner and ignited the hope to continue to help other patients when conventional pain management or surgery is ineffective. Duchess continues to have maintenance acupuncture sessions every three weeks. There was one period 3 months after initiation of therapy when Duchess missed two acupuncture sessions due to the medical issues of the other dog in the house. It became apparent to the owners that Duchess was regressing in her strength and mobility. She reverted back to dragging her toes and had lumbar pain reemerged and was comparable to her beginning acupuncture sessions. After returning to her three week maintenance schedule, Duchess once again improved in strength, was not dragging her toes and had decreased spinal pain on palpation. At this point her owners vowed that they would not miss or reschedule any of Duchess’ future appointments.